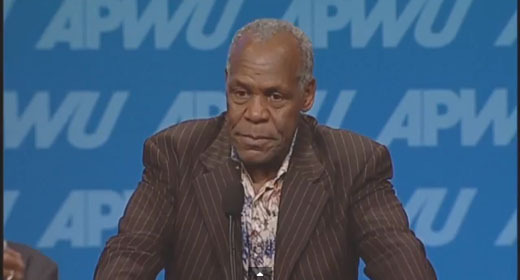 CHICAGO – At the recent national convention here of the American Postal Workers Union, actor Danny Glover delivered a speech, July 31, bringing tears to the eyes and postal workers to their feet. The son of two postal workers, Glover said his mother and father were hired by the post office in 1948, the same year as the federal workforce was desegregated. Glover, a longtime social activist, has been campaigning for the rights of Nissan autoworkers in Mississippi, making the point that “worker rights are civil rights.” The actor paid tribute to his parents saying his life “became guided” by their activism and the way they “felt about the union,” adding his father, a union stalwart, went to APWU conventions until he was 80 years old. Glover had worked at the post office as a teenager and said the postal service belongs to the public – not private interests. “We own it! We the people!” He pledged his support for the union’s campaign to save the U.S. Postal Service for the people and to stop privatization by Staples or any other concern. “I’m in!” he said. After the speech (beginning at 13:51 on the video), the union voted to make Glover an honorary member of the APWU. 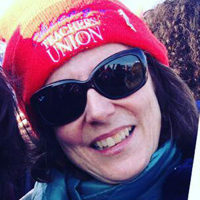 Photo: Screenshot of APWU video.